This will fly off the shelves at Starbucks. The seasonal favorite Pumpkin Spice returns soon – and will be available as a Via Ready Brew too. No need for special coupons – it will fly off the shelves. That’s about all I’ve got to say about that. Thank you so much to the partner who emailed me this. Pumpkin Spice Latte returns to Starbucks on September 4, 2012. Pumpkin Spice Via Ready Brew launches as a new product joining the Via Ready Brew lineup this September 4th. September 4th will be a big day! Please check back in and let me know how you like it. And what’s your favorite Pumpkin Spice beverage? I tried this at home this morning. I only used about 8 ounces of milk, as recommended in the instructions. I nuked 2% milk to about a drinking temperature – I carefully watched /monitored it because I don’t want my milk to boil, and I don’t like drinks too hot. And then I just added the Via and stirred. Delicious! I really do like this! I will stock up on Tuesday. The braille and large print Starbucks ordering book: What a great idea! The Big New Thing: Mocha and Vanilla Latte Via! (There’s a lot to love). Why can’t I get any pumpkin spice stuff in Ireland !!!!! 🙁 It sounds delicious ! My SM showed me this today and asked me if I thought people would buy it and I told her that I’m positive it will be harder to keep in stock than the Refresher VIA. WOW! I am excited. I cannot get enough PSLs during the fall. This might just be an item that I end up buying a LOT of to see if it is great to use at home. Interesting… this Starbucks blog post indicates Sept 6 as the PSL launch date? This looks amazing! I hope we can get it in Canada, Pumpkin Spice is my favorite! And beautiful packaging too! PSL is a favorite for the fall at my house. We grow pumpkins (when the weather cooperates), we make pumpkin muffins and pancakes, and enjoy the Pumpkin Spice hot or in frapps depending on the day. I just sent my youngest off to college a couple of weeks ago with plenty of Via in tow. Now she can enjoy Pumpkin Spice Via and not have to worry about making it to the student center’s Starbucks before class! Just wonderful. I will definitely be stocking up on these for the rest of the year when Starbucks doesn’t sell the Pumpkin Spice Latte! 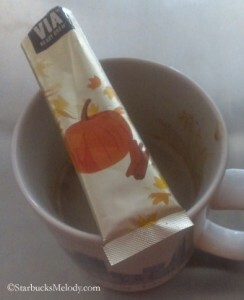 I realize LOTS of people love all ‘pumpkin spice’ but I can’t imagine how it would taste as a VIA?? seems like maybe it MIGHT be like the “cinnamon” VIA, and we all know where that went…. I think you’re right. There are an amazing number of people who really are taken by Pumpkin Spice lattes. This should be right up their alley. Even if they are not regular VIA fans. After all, besides the black market eBay listings, you can’t find pumpkin spice any where else but in the Starbucks stores. I am guessing that I am one of the few who does not care for PSL. Weird, huh? Suzanne, I don’t care for pumpkin spice either. Denise, it was sampled at a meeting I was at last week and everyone agreed that it was delicious. The directions on the box suggest using warm milk to make it, which I think would make it taste more like an actual PSL than what the cinnamon VIA was like. @Geewhy – You have a sharp eye! I think you found a mistake in that official Starbucks webpage. Love the Pumpkin Spice lattes. The VIA will be a huge hit. @Darkkatpouncing – I am with you – I will probably buy two or three of these at once and stock up. This will seriously come and go fast. I looooove PSL!! I actually bugged the baristas today if they would let me buy one…but understandably (though sadly) they said they could not until next week. This is really interesting to me….and I agree it will fly off the shelves I’m sure. As much as I like pumpkin spice, I don’t know how I feel about this. I wasn’t a fan at all of any of the flavored VIAs but maybe this will be different. I look forward to trying it! I’m curious about the calorie count & carbs in the PSL VIA? I hate the added sugars, etc. to “flavored” VIA’s. I normally just stick w/the straight coffee VIAs w/out added sugar. @Michelle was the PS Via made with warm milk at the meeting you attended? I do think it would be best made that way. Why cant they release this in the UK? 60 calories doesn’t sound too bad. Thanks for the info Nathan. I wonder if it will be a situation where it runs out fast, and then Starbucks ships a ton more. I noticed today that the Via Refreshers are suddenly back in, here in downtown Seattle. Pumpkin Spice Lattes are my overall favorite drink – I actually had one today in Helena, MT. I asked for a coconut mocha, and the barista told me they were out of coconut syrup already, but they had just gotten Pumpkin Spice in. She offered me one, and I jumped at the chance to have one early. Very exciting! Not a Pumpkin Spice Latte fan (unless they come up with a good sugar-free version). But semi-related, I was happy to see my neighborhood Starbucks had VIA Refreshers in – after being out for a month. Two Cool Lime packs left, and I snatched them up (with 50% off coupons). It’s a good day! Yum!!! Those look really good – and I bet would make Some cute Halloween gifts too! I was talking to one of the Partners yesterday about PSL and I told her my dislike for the drink. She pretty much hit the nail on the head when she told me she thought the flavor was a little too intense and maybe I should try it with less pumps of syrup. Why didn’t I think of that?! 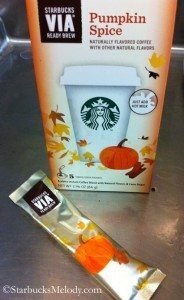 I will give it another try and will probably buy a few of the Via packs for my husband, he loves PSL. Ditto, @Sandra! I love to sub half the syrup amount in a PSL with Cinnamon Dolce– but I keep *both* types of sprinkles! I call it a “Pumpkin Dolce”. Sooo delicious. Can’t wait for next week! Any chance they’ll have a Skinny PSL this season, as they put in the Skinny Mocha recently? @Suzanne: I meant to write this earlier……..PSL is not-so-good to me. I can’t even describe what it tastes like to me…..I know a lot of people find it really sweet, but I think I remember just thinking it was not very “pumpkin” and kind of …bland.? (I would also need so many extra shots) totally realizing I’m the odd one out here! I do get it once in a while for my mom….who likes it ok but also says she tastes no pumpkin at all. ??? BUT, for those millions who look fwd to it and love it, I’m very happy for them. I’m with you @Suzanne and @denise. The concept is appealing to me (I love pumpkin), but the drink doesn’t deliver for me. I’m happy for all those who love it though. It’s definitely something that resonates with a lot of people. So much so that in the last few years, Panera and many other places have offered their own versions. None of which seem to slow down the Starbucks PSL juggernaut. Another tasty variation is to sub half of the pumpkin spice syrup with white mocha sauce. Tastes like a pumpkin pie with whipped cream! I am going to try the half cinnamon dulce half PS recipe! Thanks MCW! I had a customer who ordered a pumpkin spice chai last year. I would have expected her to ask for it half sweet, but no. Apparently it is delicious. I’ve heard the pumpkin spice tastes different this year, and I think it looks much less orange than I remember it being previously. @Michelle – I am not a Pumpkin Spice expert. I order a few and then go back to Clover brewed coffee, often. Whatever it was like before, I think this year’s is great. It’s not too sweet for me. We sold out yesterday on the first day. I foresee us not keeping it for more than a day or two after shipment. The Starbucks VIA Ready To Brew in the Pumpkin Spice tasted HORRIBLE to me. I love the Starbucks Pumpkin Spice Latte made by the Baristas, but THIS was really bad. Am I really the only one that thinks the VIA product in this flavor was bad? @Millie: No, you’re not alone. I thought it was totally tasteless. I’ll use my remaining pckgs for baking.